*Today I donated blood during the KHS Blood Drive. 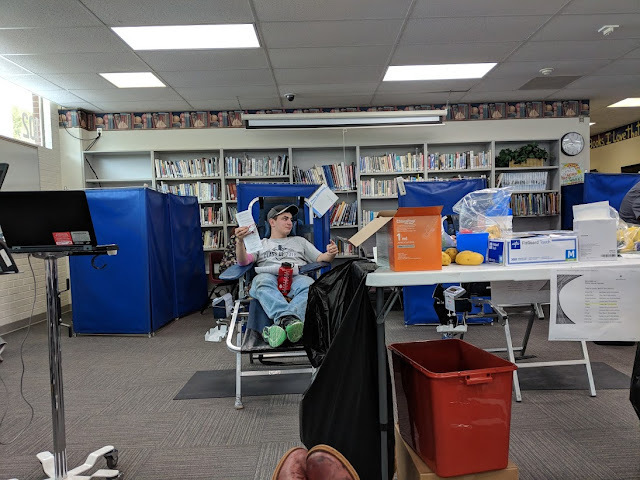 According to the organizers it was a very successful event, and I think they collected 30 pints of blood, which was their goal. *Mr. Lucier and I went into two Junior U.S. History classes to talk to about what they should be doing to prepare to go on to college. I felt like we threw a lot of information at them, but I hope it helped. *The giving of blood did wear me out. I was in bed by about 8:30 p.m. last night. I kept trying to read my book, and kept nodding off to sleep. *I have been a bit behind in sharing my 52 Cups of Poems. I posted another one last night, titled Keeping My Eyes on Kellogg. You can find it here. Enjoy the people, places and things about the Silver Valley happening yesterday and today. Vandal Grads and Two "G's"
"History of the Coeur d' Alene Mission of The Sacred Heart" by Reverend Edmund R. Cody, M.A. "The Coeur d'Alene Reservation and Our Friends the Coeur d'Alene Indians" by Lawrence Palladino, S.J. Ethereal theme. Theme images by naphtalina. Powered by Blogger.